TOKYO, September 1, 2015 - Canon Inc. announced today that it is developing an LCOS projector capable of displaying 5,000 lumen video and still images at a resolution of 4,096 x 2,400 pixels, a level of definition that surpasses the 4,096 x 2,160 pixel-resolution of 4K digital cinema. Tracing its beginnings to the movie industry, 4K-resolution content has been gaining traction in the broadcasting industry. Amid ongoing advances in image quality and definition made possible by the introduction of a growing number of 4K production tools, Canon is leveraging its proprietary optical technologies to make its entry into the 4K projector market in 2016. In addition to growing demand for high-resolution, high-quality imaging performance, there is an increased need for projectors that enable projection from close-range installation locations and offer compatibility with a variety of installation environments to facilitate use in such settings as museums with limited available space, driving and flight simulators, and on the design scene. In response to these needs, Canon is developing the 4K projector as a new model within its Power Projector (REALiS and XEED in other regions) series that not only achieves high brightness and high resolution, but also has a compact and lightweight body to accommodate a range of installation environments. Equipped with a high-definition 4,096 x 2,400 pixel LCOS panel, the Canon 4K projector under development will support the projection of high-definition content that exceeds the resolution offered by 4K digital cinema. 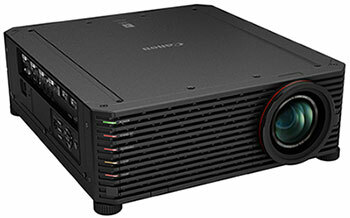 While increases in brightness performance for projectors commonly require larger lamps and cooling systems, resulting in increases in projector body size, Canon’s proprietary AISYS optical system delivers bright 5,000 lumens performance while making possible significant reductions in body size and weight. Additionally, the projector will feature a newly developed 4K wide zoom lens capable of projecting large images from a short throw distance, as well as an optical focusing function that enables the projection of images on curved-surface screens. Through the further enhancement of its Power Projector series lineup, Canon will strive to respond to the diverse needs of users.